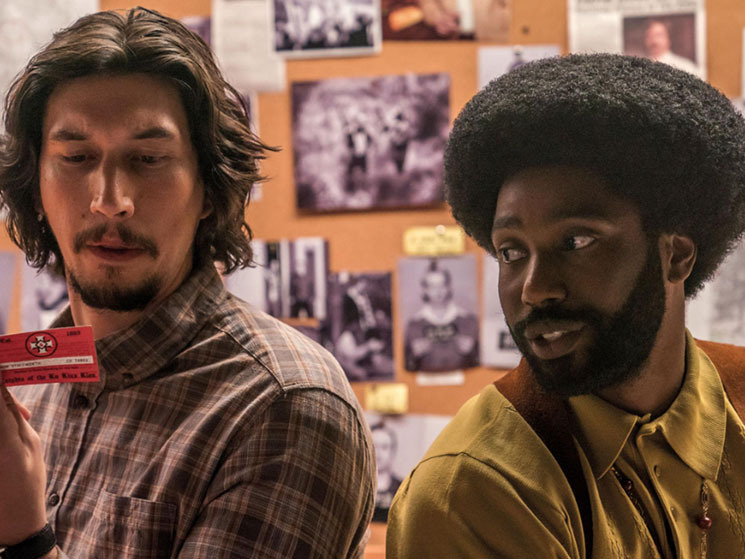 BlacKkKlansman takes place against the backdrop of Richard Nixon and the Vietnam War, but despite the setting, it's not actually about the 1970s. Rather, Spike Lee's latest is all about America's current political moment, and the film's central concerns — hateful rhetoric dressed up as "pride," prejudiced cops abusing their power — feel viscerally relevant. The film tells the true story of Ron Stallworth (John David Washington), a black undercover detective from Colorado Springs who, with the help of Jewish colleague Flip (Adam Driver), successfully infiltrates the Ku Klux Klan, and even strikes up a phone correspondence with Grand Wizard David Duke (played with a mixture of menace and dorkiness by Topher Grace). Duke is infamous for giving racism a buttoned-down makeover, and it's implied in the film that he may one day run for office. It's no coincidence that he directly echoes Trump's xenophobic rhetoric, as he speaks about returning America to "greatness," and at one point toasts the Klansmen with "America first!" The message is clear: David Duke may never have successfully run for office, but his brand of mainstream racism is thriving in 2018. Meanwhile, a group of black activists, led by Stallworth's love interest Patrice (Laura Harrier), stage protests and campaign for the liberation of their people. Lee's masterfully patient pacing gives the activists plenty of time to listen to speeches that lay out messages of resistance and unity. Not only is BlacKkKlansman a scathing condemnation of racism, it's also a loving celebration of African American culture. During one extended nightclub sequence, Ron and Patrice joyfully dance to beautiful soul music while surrounded by members of their community; later, the two banter about their favourite movies at length and debate the merits of Super Fly v. Shaft. The story doesn't hinge on these moments, but the scenes make it all the more vile when the Klan claim that white culture is superior. Lee expertly balances comedy with truly terrifying displays of racism, making the film lively and entertaining despite its weighty subject matter. It's easy to snigger at the Klansmen's absurd sense of self-importance and juvenile boys' club rituals, but the hilarity shifts to disgust as the supremacists hatch a violent plot during the film's tense second half. BlacKkKlansman is an inspiring, big-hearted movie that will make audiences laugh while also driving home its message. But as optimistic as the tone is, there's an ominous cloud hanging over the film: we've all seen how white nationalists have been emboldened in recent years, and the closing sequence — without giving too much away here — brings historical racism squarely into the present. Ultimately, this is more than just a fascinating true story about a charismatic undercover cop — it's a reminder of the atrocities of the past, and a stern warning about the current direction of America.